October 12, 6:00 to 10:00 PM – Opening night performance of Skinplant by Infranatural, a collaboration of Joan Didier, Oliver Hess and Marcos Lutyens. Their performance is part of Pasadena ArtNight. For free shuttle bus service between the venues, please visit (need to get URL).  Made possible in part by the Pasadena Arts & Culture Commission and the City of Pasadena Cultural Affairs. 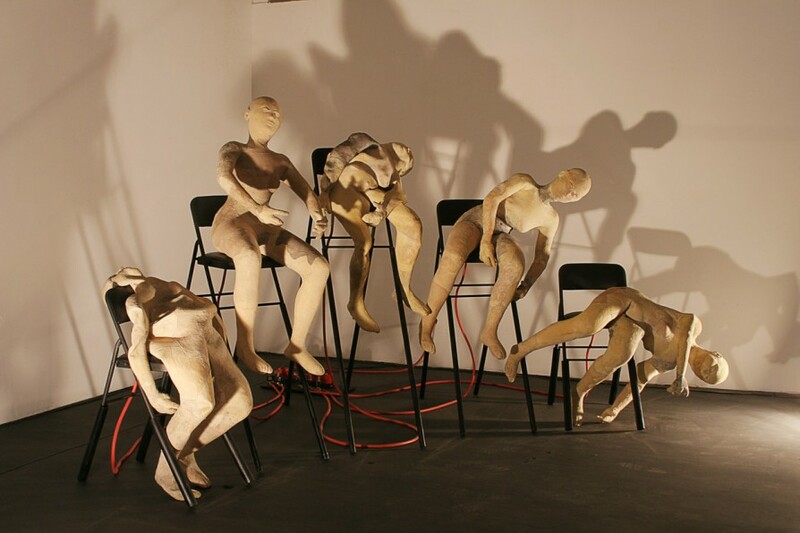 Deidre DeFranceaux’s Zoom presents inflateable skins of latex, each in the form of a life-size human being, and attached to air pumps, creating a life like crumbling and resurrection of the kinetic figures. Thadeus Frazier-Reed’s skinTones uses digital photographs of peoples’ skin, displayed on an LCD monitor, to control multiple audio oscillators. The frequencies of the oscillators are directly affected by the “tone” of the skin colors through photoresistors mounted in front of the monitor. 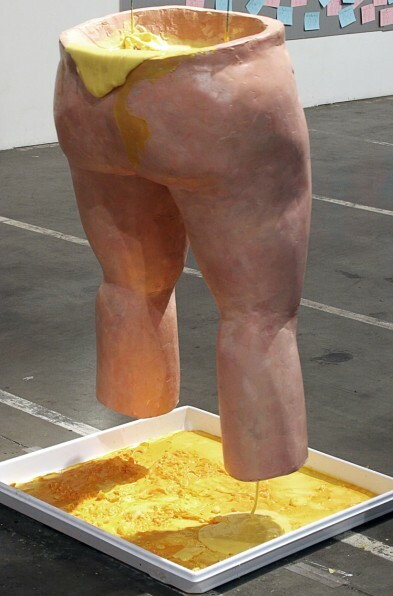 Sara Hunsucker’s Fat Pants Wishing Well employs 130 lbs of fake fat in a pants-like skin to create an audience inter-active installation exploring the dramatic weight loss following gastric bypass surgery. Don Jim’s The Lavish L Series explores all angles and aspects of the naked skin of a zaftig lady in ten poses, using his extraordinary skill in silver-tone pbotographic printing to create 8 variations on his theme. Kris Kessey has made a large section/slab of skin that evokes thoughts of something that could have been just cut off for tanning… but something more human than animal… a surface full of texture – scars, lumps, bumps and interesting surfaces. 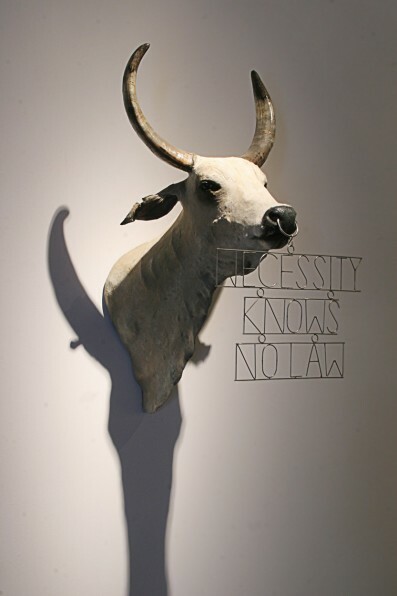 Los Animistas (Dr. Carlos Arredondo Antunez, Alberto del Rey and Tammy Singer) use taxidermic art and video to probe our fascination with so-called “primitive culture”, springing from our longing for the lost sense of unity with all living beings. Ted Meyer’s Scarred for Life consists of mono-prints of surgical scars, each accompanied by a photograph of the bearer of the scar and enlightening commentary and information about each story behind these images. John O’Brien and Maria Cielo Pessione employ video imagery to explore the changes in their own skins over a one-month period. The work is exhibited as an-ever-changing grid of skin close-ups. Benjamin Page’s The Sound of Bubbles: you know you want to and I know it too!!! uses photo-imagery and bubble wrap to “examine the intriguing sensory stratification and noise making of a would-be very personal and private experience of popping pimples or picking at other disgusting skin conditions. Laurel Paley’s Inventory is an installation exploring of 20 11” x 14” photographs of her own body, specifically surgical scars, varicosities, veins, and breast self-examination. 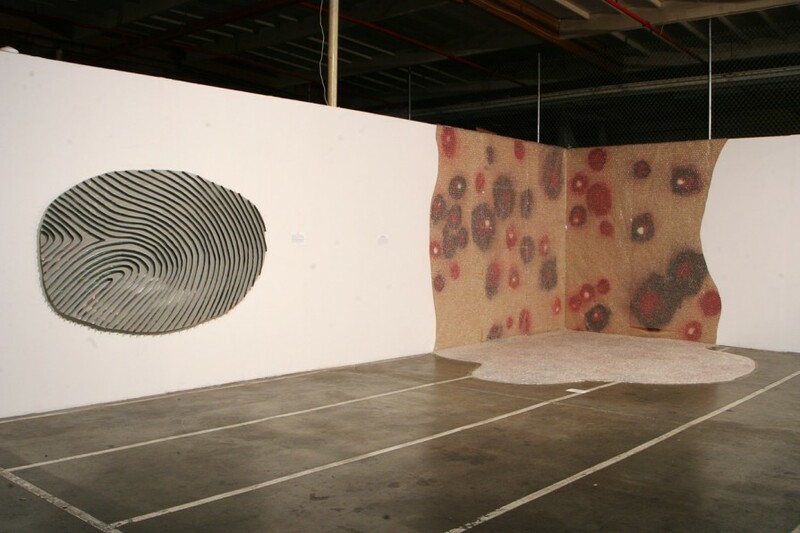 Karen Reitzel’s Grubby is a large scale-scale (8’ x 5’), 3-dimensional blow up of a fingerprint which, when viewed from different angles transforms from a secondary image of water to one of chrome.